Thirteen Diamonds By the Yard Necklace 6.50 tcw. Thirteen Diamonds By the Yard Necklace 3.90 tcw. Thirteen Diamonds By the Yard Necklace 3.25 tcw. Thirteen Diamonds By the Yard Necklace 2.60 tcw. Thirteen Diamonds By the Yard Necklace 1.95 tcw. Thirteen Diamonds By the Yard Necklace 1.30 tcw. Thirteen Diamonds By the Yard Necklace 0.65 tcw. Seven Diamonds By the Yard Necklace 3.50 tcw. Seven Diamonds By the Yard Necklace 2.10 tcw. Seven Diamonds By the Yard Necklace 1.75 tcw. Seven Diamonds By the Yard Necklace 1.40 tcw. 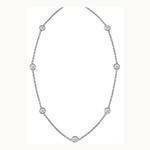 Seven Diamonds By the Yard Necklace 1.05 tcw. 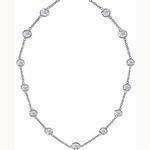 Seven Diamonds By the Yard Necklace 0.70 tcw. Seven Diamonds By the Yard Necklace 0.30 tcw.